Dynapenia is the loss of muscle strength, (rather than muscle mass) and is often associated with older adults. It can have devastating effects on a person’s ability to perform everyday activities. Climbing stairs, picking up a grandchild, or quite simply getting out of a chair or the bathtub become barely possible. Additionally, this loss of muscle strength can create a greater risk of falling for our older adults. Getting older may mean slowing down in some areas, but as far as training goes, it’s time to get busy! Basic movements, such as box step ups can improve balance which will allow the elderly to navigate stairs and steps better. Practicing box squats will increase overall leg and hip strength so standing from a seated position becomes easier. Because CrossFit is so adaptable, our elderly can greatly benefit from this style of training. They become stronger and more confident. Daily tasks can be far less exasperating, which makes life much more enjoyable. Not everyone needs high intensity, for the elderly, training at lower intensities is sufficient to initiate neuromuscular improvements. 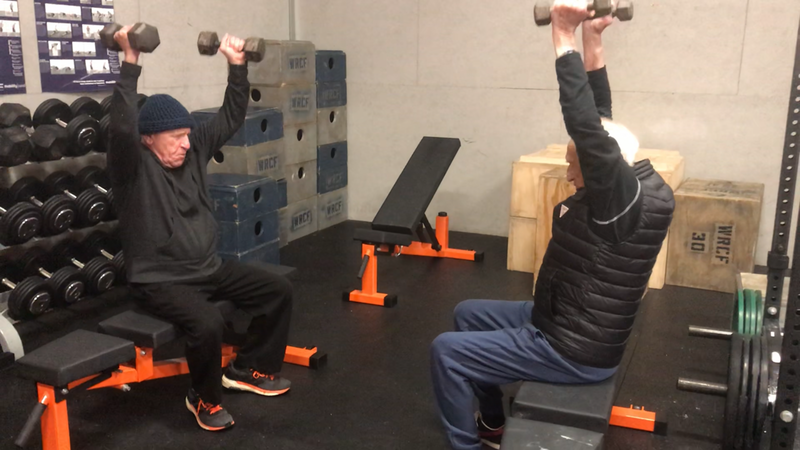 Building a level of muscular strength that will allow our elderly to continue to maintain independence is of great importance. Not only could it possibly add years to their lives, but more importantly, quality to their years. Another added benefit to a CrossFit-based group-exercise program is that it is an effective method to reduce loneliness. Get started with a No Sweat Intro.